Recently we’ve noticed a proliferation of unsolicited email newsletters in our mailboxes. The aim seems to be to engage while diverting your attention away from the fact that you didn’t request to be notified about this particular topic by this company in the first place. Regardless of whether you’re interested in the topic at hand, this is a violation of your privacy rights. And, in some cases, the unsolicited email newsletter will lead to a malicious source, that may contain viruses and or spyware. Here’s how to handle these newsletters. First off, it’s a good idea to screen all your incoming email with software that can prevent malicious content and/or attachments from adversely affecting you. We recommend (and use ourselves) Firetrust’s Mailwasher. Without a screener, we urge you to refrain from opening potentially questionable emails. This especially applies to their attachments. Check and see what the recipient email address of the newsletter is. If it’s not yours, or is sent to multiple people or “undisclosed recipients,” it is most likely a spam email that may link to malicious content on the web (or contain a virus attachment). Our advice is to delete it and report it as spam. If you receive it again, file a report with us. If the recipient of the newsletter is indeed your email address, you’ll want to proceed to see if the newsletter appears legitimate or not. Look at (without clicking on) the website URL source (viewable in MailWasher) and see if it links to a legitimate website. You can type the website URL by searching for it in your search engine without actually visiting the site itself. This will help you get an idea of whether the site is legitimate or not. 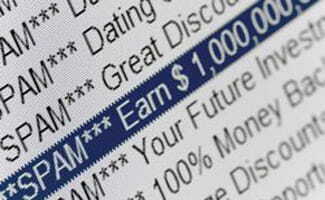 Never click on a link in an email (or on a website) that is untrusted. Next, every legitimate newsletter should have an unsubscribe, opt-out or remove me option, usually found in the footer. If your newsletter doesn’t, chances are high that it’s not legitimate. If there is an unsubscribe link, there’s always the chance the unsubscribe link itself leads to a malicious source. For this reason, repeat the step above (#1 and 2) to analyze the unsubscribe source (website). If you’re certain the unsubscribe website is legitimate, go ahead and follow the unsubscribe process to remove yourself. If you’re uncertain, feel free to comment below and we’ll analyze for you. Next, you’ll want to report the sender to the newsletter provider, and make them aware that you received an unsolicited email newsletter from them. If they get enough responses, they will usually take action and close the offending account.